Tri color tomato and spinach pasta, blended with colorful veggies and a simple ranch vinaigrette dressing. 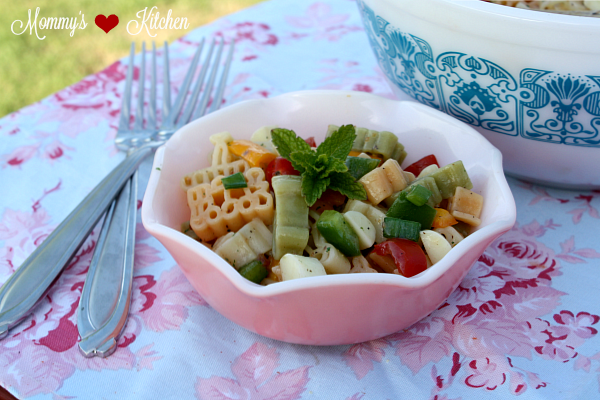 Today I have a fun and tasty pasta salad recipe to share with you. 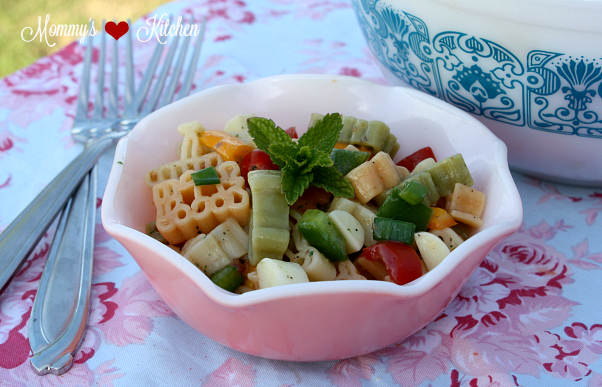 Pasta salads are quite popular and the flavor variations are endless. They are also one of the easiest sides you can bring to a cookout, picnic or potluck, but finding a salad recipe that can withstand the heat of summer can sometimes be a challenge. For me, when choosing a salad for a cookout or picnic I tend to steer clear from any salad with a creamy style dressing. Sure, they're delicious, but not the best choice when it's hot outside or if the salad will be sitting on a potluck or a picnic table. I usually opt for a simple pasta salad with an easy vinaigrette. Pasta salads seem to hold up pretty well and the dressing doesn't separate. Last month you may remember my blog post for Grilled Balsamic Steak & Coconut Rice Pudding that I made from products new to Walmart. 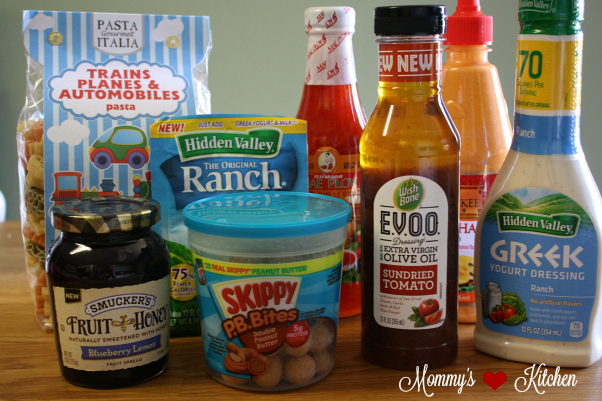 Well, this month I received a second sample box with additional new food products, and was asked to pick my favorites again and create a second recipe. When I opened the sample box the Smuckers Fruit & Honey Spread immediately caught my eye, so I plan on using it to make individual blackberry lemon tarts at a later date. I also have a filled cookie recipe in mind using the Skippy Double P.B. Bites. I moved onto the Pasta Gourmet Italia plane, train & automobile shaped pasta, the Wishbone Evoo Sun Dried Tomato Dressing and the new Hidden Valley Ranch Greek Yogurt Dressing. I thought I could use all three of these items and come up with a really good pasta salad. 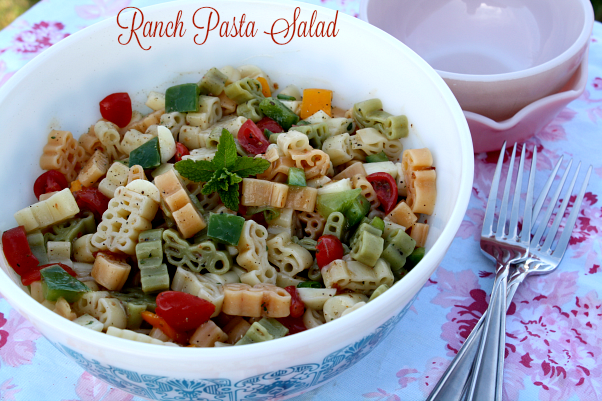 This Ranch Pasta Salad has a vinaigrette based dressing instead of the creamy ranch dressing you're used to. I combined the Hidden Valley Ranch, Greek Dressing packet with 3/4 cup of the Sun dried Tomato EVOO Dressing and the flavor was so good that I didn't even miss creaminess of regular ranch dressing. I added cooked planes, trains, and automobile shaped pasta, various veggies, and cheese. That's it's super simple to make. I have to say this was the best pasta salad I've had, but then I'm a little bit bias since I made it LOL. No, really it was very good and I love that it was a ranch salad, but not a creamy dairy style pasta salad. The shapes of the pasta were a fun addition and I loved that the pasta gets it's bright coloring from tomatoes and spinach and not a food dye. 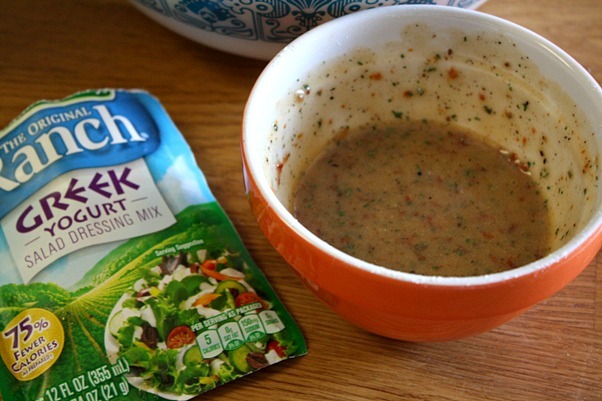 This dressing easily blends together and the combined flavor taste fabulous. The coloring of the pasta and all the vegetables look so pretty together. Plus the fun shapes make this salad very kid friendly. I wasn't sure if my daughter would like this salad with all the veggies, but she had a serving and ended up loving it. I hope you'll give this recipe a try, because I don't think you'll be disappointed. Bring a large pot of lightly salted water to a boil. Stir in the pasta and cook for 10 to 12 minutes or until slightly passed al dente. While the pasta cooks chop up all the vegetables, onions, and cut the string cheese into 1/2 inch pieces. Set aside. Drain the pasta into a strainer and rinse under cold water to stop the cooking process. In a large bowl, combine the cooked pasta, vegetables, edamame (if using), and cheese. Pour the dressing mixture over the pasta and vegetables, and lightly toss to blend. Add salt and pepper, to taste if needed. Cover salad and chill for at least 2 hours. Lightly toss salad to blend just before serving. Cook's Note: one 6 oz can drained and sliced black olives and crumbled Feta cheese can also be added. If you add Feta cheese omit the mozzarella string cheese and add the Feta cheese just before serving. 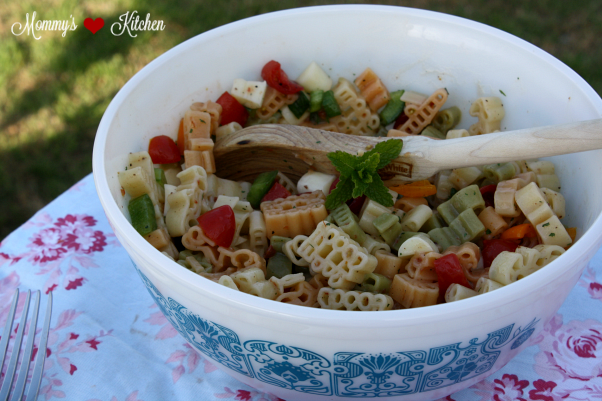 I love pasta salads; especially during the summer. Will be making this next week to go along with my hamburgers.